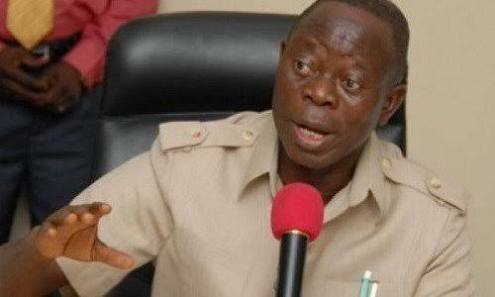 Adams Oshiomhole, the embattled national chairman of the All Progressive Congress (APC) has finally opened up on why the Department of State Service (DSS) invited him for questioning. There were reports that Mr Oshiomhole was picked up by operatives of the DSS earlier in the week. The reports said the APC chairman was asked to step down from office. The former Edo governor was also reported to have jetted out of the country due to intense pressure from the security outfit and some state governors of his party who are currently engaged in a show of strength with him. Oshiomhole while reacting to the report on Saturday said he went to the United States to see his wife and thereafter headed for the United Kingdom to meet with Bola Tinubu, a chieftain of the ruling party, dismissing insinuations that he has been scheduled to meet again with the DSS. Addressing selected reporters in Lagos, the former governor dismissed reports of his arrest saying he went to the DSS after being invited to turn himself in. He said his summon has to do with party primaries of the APC, querying if the DSS has the right to obstruct the affairs of a political party. “Our conversation centered around APC primaries,” Oshiomhole said. He also denied insinuations that the query centered round corruption allegations thrown at him when he held sway as governor. “The question now is whether or not it is the DSS job to interfere in a political party’s issues. And if there’s an allegation of corruption, it is the responsibility of EFCC and ICPC,” he added.